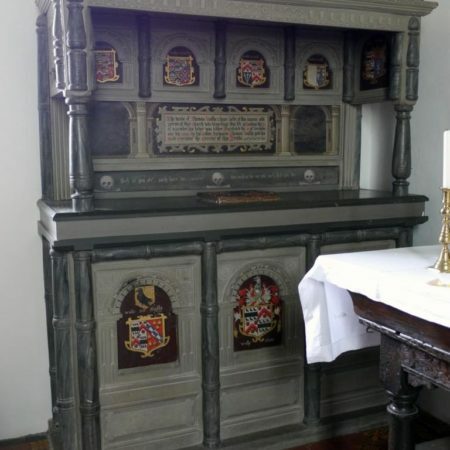 This month’s monument of the month focusses on two similar monuments commemorating members of the Walsh family in adjacent parishes in Worcestershire. They are of an unusual type, being constructed from wood rather than stone, but both heavily painted to disguise the underlying material and to give the impression that they were prestigious stone monuments. The choice of material may have been an economy measure. It is likely that wooden monuments were once less rare than they now appear, but the twin forces of Puritan iconoclasm and decay probably lead to the loss of many. Those that survive, especially examples which imitated stone monuments, are thus of special interest. 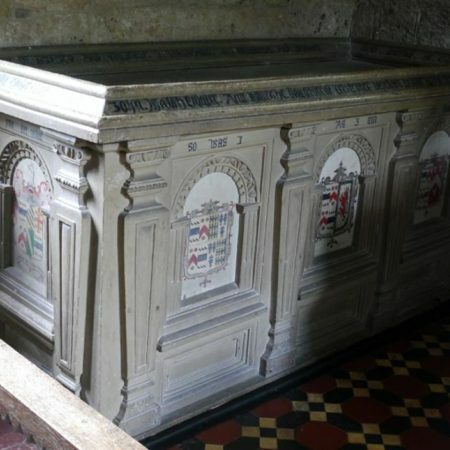 There is no effigy, but the identity of the person commemorated is provided by an inscription on the back of the tomb reading: ‘The tombe of Thomas Walshe esquier Lord of this manor and patron of this church who departinge this life at London the 21 of November his bodye was hither translated the 21 of December A[nn]o D[omin]i 1593 by his cosine jarmaine Thomas Walshe gent his sole Executor the Erector of this tombe’. This is supplemented by a Latin inscription round the edge of the flat top which is partly concealed and difficult to view. This explains that Thomas was the son of Thomas Walshe, one of the barons of the Exchequer to Henry VIII, and Catherine his wife, daughter of John Saxilby, chief clerk of the household to Henry VII, and Elizabeth his wife; Elizabeth was the daughter of John Gainsford of Surrey. Thomas Walshe, the father of the Thomas here commemorated, was the second son of John Walshe of Shelsley Walsh and Margaret his wife, who was the sister of Sir Edward Blount of Sodington. These inscriptions shows that lineage and descent were important to Thomas or to his cousin Jarmaine who acted as his executor. This view is reinforced by the prominent display of heraldry on the monument. On the flat top of the tomb is a raised shield with the arms of Walshe differenced by a ring. The rest of the tomb is richly embellished by many other shields with the arms of many of his connection and labels giving the names of the families concerned. A warning to the viewer is provided by a brief inscription at the back of the canopy reading ‘Such as you are such were we. But such as we are now such shall you bee’. Three delightful skulls apparently gnawing at bones flank and separate the two sentences. 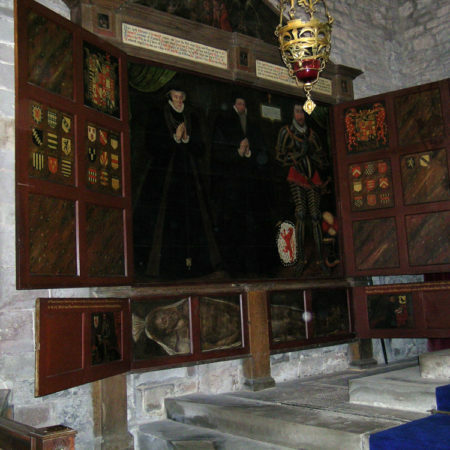 At the northeast of the chancel of Shelsey Walsh church is a painted wood rectangular tomb chest with tapering pilasters and with panels with blank arches enclosing shields (Fig. 2). Again there is no effigy. The flat sunk top has a moulded edge with an inscription on the chamfers inside and outside. It reads: ‘Heere lieth Fraunces Wallsh esquire sonne and heire to John Wallsh esquire and Allice the daughter of Cristepher Baynham knight which Francis married Anne the daughter of Richard Cornewhall barron of Barford and had issue 3 sonns and 6 daughters and departed this mortale lif the 19 of July in the year of our Lord God anno Domini 1596’. 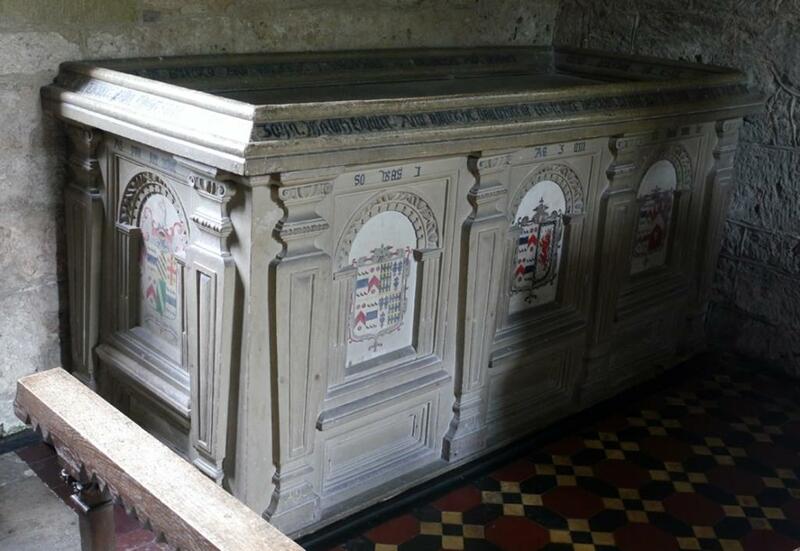 Like his kinsman’s monument, Frances Walsh’s chest has a prominent display of heraldry. The shield on the west side has evidently been repainted; it represents Walshe with five quarterings, with the crest, a griffon’s head razed and the motto ‘Veritaset Virtus Vicinae’. The other shields show the arms of family connections, although they do not have identifying labels. 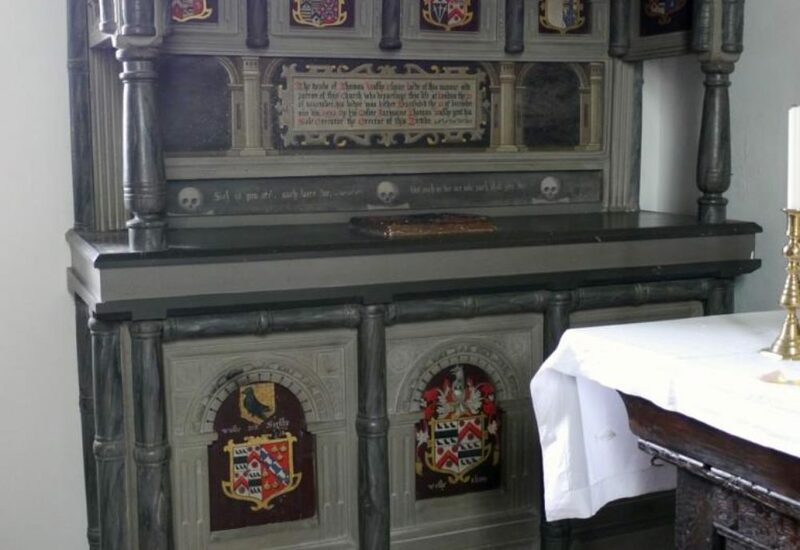 Another touch evidently copied from the Stockton tomb is a memento mori inscription running above these shields. It reads: ‘As you are nowe so was I. As I am so shall you be’. There can be little doubt that the two monuments were designed and carved by the same hand. 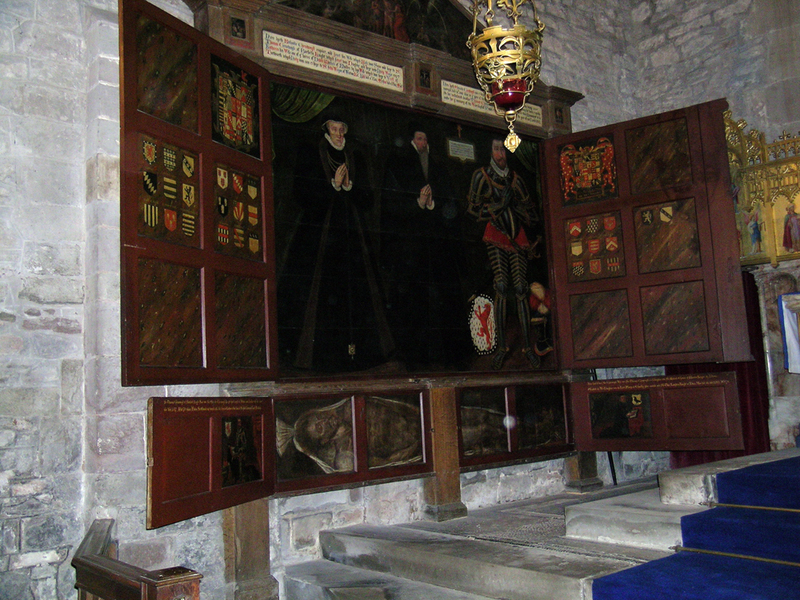 They are not signed, but Nigel Llewellyn has persuasively suggested that they are the work of the foreign painter Melchior Salaboss, who signed the magnificent painted triptych commemorating several generations of the Cornwall family at Burford (Shropshire) (Fig. 3). 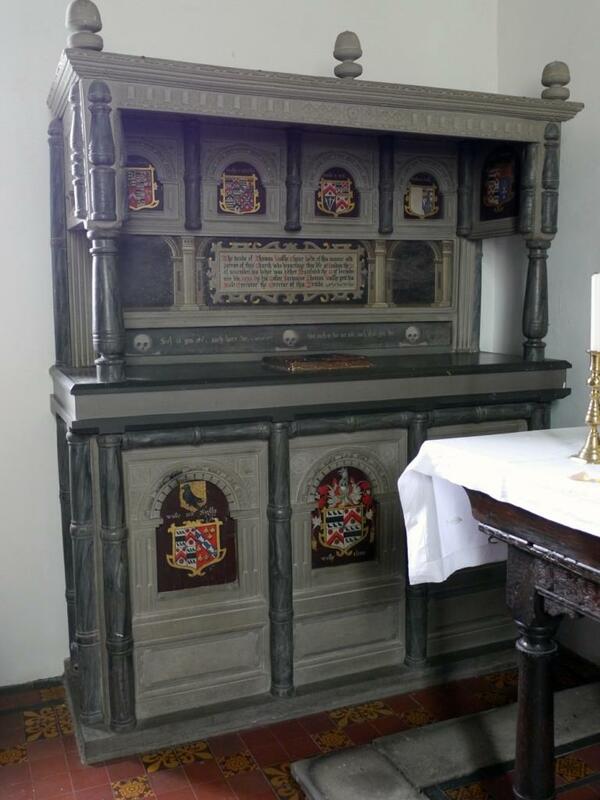 This was commissioned in 1588 by Thomas Cornwall, who was the brother of Anne Walsh of Shelsey Walsh.